The unit can be set to operate in Chorus, Vibrato or Tremolo modes by the front panel switch. 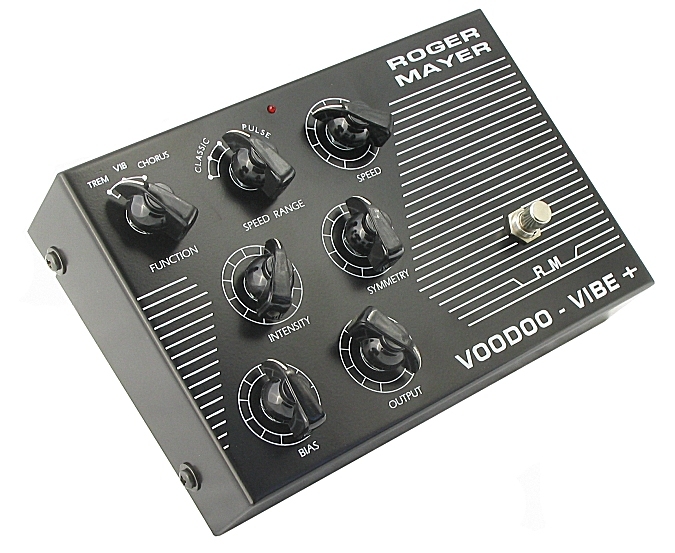 The Voodoo-Vibe+ enables a selection of three speed ranges of either Classic or Pulse waveform. These two different types of sweep waveform when used in conjunction with the Symmetry control will allow completely different types of sweep effects to be produced. The maximum speed has been greatly increased to provide a blurred effect with sub-harmonic undertones being produced as the frequency reaches maximum. The maximum speed capacity should be investigated in any of the three operational modes together with the various intensity and symmetery parameters. This control allows the fine setting of the speed range as selected by the Speed Range switch. 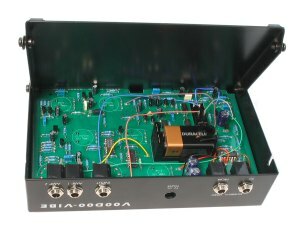 This controls the linearity of the Classic and ON/OFF ratio of the Pulse waves, which are used to sweep the filter sections or modulate the tremolo section. When the ratio of the rise and fall time of the Classic wave is varied from the usual symmetrical 50% to other values it has the audible effect of altering the way the filter sweeps as the symmetry is adjusted away from the norm. It is now possible to have a fast rise and a slow decay or the reverse by manipulation of this control. The ON/OFF ration of the pulse wave can be varied in a similar manner to provide variable switching waveforms for the modulation filters or tremolo section. The intensity ,bias and symmetery controls work together providing a wide range of effects. This control enables the unit to be tuned to produce different sweep effects in the chorus and vibrato modes and will change the centre sweep frequency. In the tremolo mode the bias sets the depth of effect as well as the offset. This control is one of the most important sweep parameters to get right and it pays to only make small changes and carefully evaluate them. The level of depth of effect can be set by this control and is used in conjunction with the other controls to set up the effect required. This controls sets the Output Level required. The unit is powered on by inserting a lead into this socket when using the internal 9V battery. Keep the plug out of this socket when not in use. This is a hard wire or true bypass output. The dual buffered outputs are disconnected when this output is selected. These are identical dual low impedance Class A buffered outputs and are provided to act as a splitter both in the bypass and effect modes thus enabling long cable lengths to be driven with no high frequency loss or to facilitate parallel path signal processing. These two jack sockets are for connection to an external foot volume pedal (not supplied) for the external control of speed. Please consult website/manuals to download wiring diagrams to allow the use of commercial volume pedals. An external AC adapter (not supplied) can be used and access is through a standard DC power jack situated next to the jack sockets. It uses the standard negative centre pin connection protocol used by many leading manufacturers. Internal onboard filtering ensures that optimum low noise performance is maintained and diode protection provides peace of mind in case of polarity setting mistakes. Access to the internal battery is made by loosing the 4 screws on the bottom to allow the cover to open and it is recommended to use a premium alkaline type battery for the longest life. The LED indicator shows the status of the unit. 9V alkaline battery or AC adapter 9V rating 50mA. A regulated type adapter is recommended. 220 (W) x 75(H) x 150(D) mm.